One would assume that with it's generic title, release date and desperate seeming casting that No Escape would probably be pretty terrible. The indicators all align and are partially right, no doubt, as the grungy look of the movie suggests it won't be a pretty picture figuratively or literally. The glaring reason the film stands up to a serious questioning of quality though is the fact director John Erick Dowdle and his co-writer brother, Drew, only have three prior credits to their name, all of which are considered rather sub-par horror flicks (though I rather enjoyed Devil and haven't seen As Above, So Below). The Dowdle's approached No Escape not with the eyes of their honed horror mentalities though, but with that of their teen action fantasies they no doubt devoured in the eighties. Granted, we're still talking about the rather generic action movies of that decade, but campy and somewhat solid action movies nonetheless. No Escape has plenty to offer when it comes to tension and thrills and even wants to bring itself to hint at something more in certain spots, but is instead swallowed up by the fact there is no context for the situations we see play out and no weight to the simple consequences put into effect. Run or die is the name of the game and the literal nameless Asian villains do little to make us feel as if there is any validity to the scenarios our protagonists find themselves in. Rather, we are dropped into the middle of this civil war where the strictly labeled bad guys march around and murder hundreds of people execution style. We aren't privy to the information of who is or isn't safe until about halfway through the film when a half-hearted attempt at exposition is laid out for us, but by that point we know what No Escape is heading towards no matter how tense it might make us at certain times. That said, this is a film that strangely enough had a strong affect on me as I was watching it, but is one I never have any desire to sit through again. 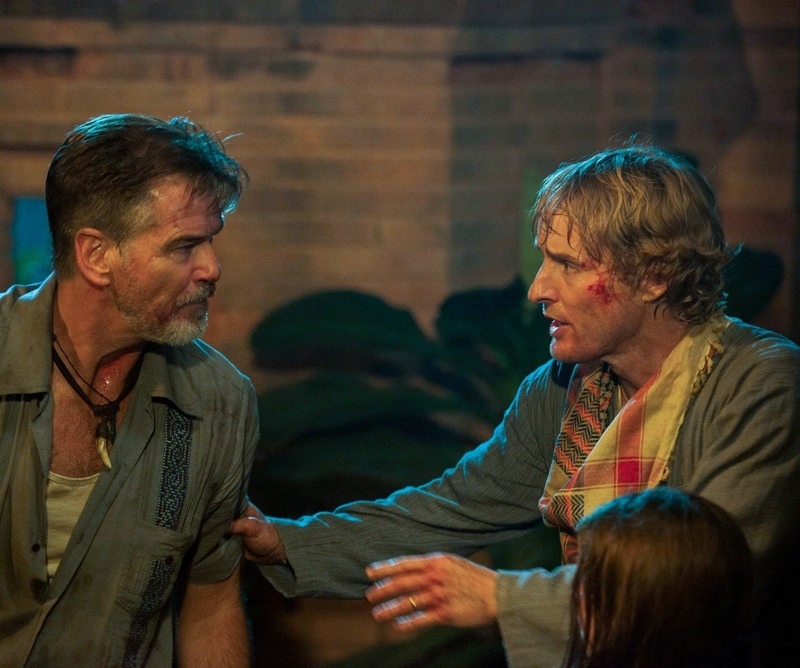 Hammond (Pierce Brosnan) and Jack Dwyer (Owen Wilson) are on the run in No Escape. 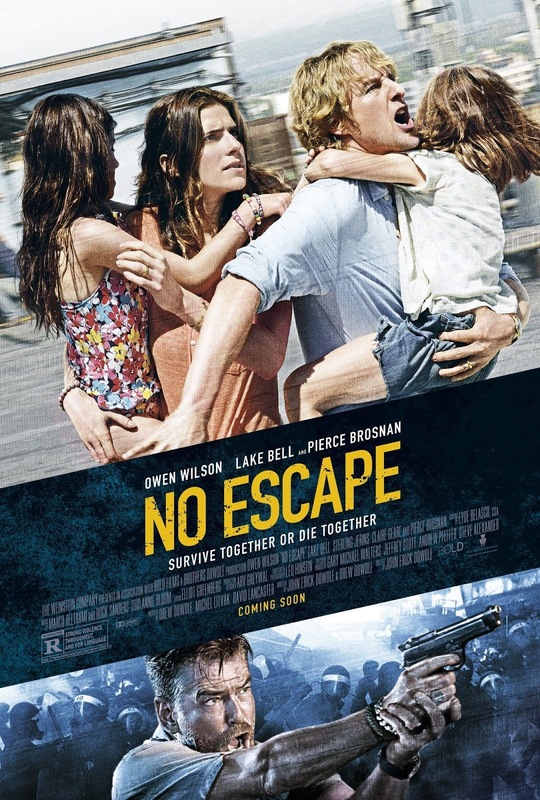 Jack Dwyer (Owen Wilson) is moving his family, including wife Annie (Lake Bell) and two daughters (Sterling Jerins and Claire Geare), to an unspecified Asian country that apparently borders Vietnam for reasons having to deal with his job. Jack's dialogue explains that he is an engineer who was once on the cusp of greatness, but it never played out and now he's having to resort to such current tactics in order to support them. It is also hinted at that the last few years of marriage between Jack and Annie haven't been the greatest and that this move in is something of a last ditch effort to restore some type of structure to their family. On their second morning in their new home Jack goes out to acclimate himself to his new surroundings and pick up a paper, but ends up being caught in the middle of this war zone where rebel radicals are rising up against the police force in the streets of a market. After narrowly escaping and watching the rebels blow another Americans head off in front of their hotel Jack jumps into action in order to protect his family. Naturally, the group of antagonists that I can only identify as such because no country is specified and no names or indicators are given other than red bandanas, are relentless in their need to kill all of the Americans and so Jack really has the odds stacked against him. Lucky for Jack, Annie and the girls they made a new friend upon arrival in Hammond (Pierce Brosnan). Brosnan presents a facade of a grizzled old man with only a taste for younger women, but of course he too comes to be more than he initially appears. Brosnan's presence these days only seems to cheapen a project more, but here he is the savior in more ways than one. With Brosnan's skills as well as the screenwriters willingness to not over-indulge simply because they were able to get Brosnan the film comes out less predictable than it might have. For a long time No Escape strangely counters one's low expectations, but it eventually has nowhere else to go and comes to a conclusion that, despite knowing it's coming, still feels absurd. That moment halfway through the film where No Escape stops to spill exposition comes when the script forces Wilson's Jack into an unbelievable action sequence when it would have been better off sticking to the low-key abilities of Jack to elude those that are after him. The film would have still been able to stick to it's potboiler roots, but it would have proved greatly effective to keep things on a tight string of tension rather than having our main character snip that string for the sake of an action set piece. What this out-of-character moment allows for though is the re-introduction of Brosnan's character who feels wholly unnecessary and a McGuffin in and of himself that was only created to safely guide our heroes through the remainder of the narrative. I could forgive the film for being slightly racist when it came to casting the villains solely as a certain ethnicity while providing no reasoning or context for their unbelievable hatred, but if the narrative was also going to become as rote and unoriginal as the films villain then it would be time to pack it up and move on. Right when I thought the movie would fall into this trap it reversed my expectations and gave a renewed sense of curiosity. In the midst of Hammond's rescue he tells Jack of how the rebel leaders see us the same way we see them and that in all actuality most of them are just trying to protect their families. This lends the film a certain something, a moral conundrum if you will that could make things interesting, but unfortunately it goes nowhere. It goes nowhere because we never buy that the intended villains are fighting for anything, but are more just psychotic murderers on a rampage. If you can get past this qualm and simply take No Escape as an action thriller with legitimately tense moments and emotional stakes that involve only white, American lives than you'll be more than entertained, but if you begin to ponder the deeper complexities of these dynamics things will fall apart quickly. Jack guides his wife (Lake Bell) and their two daughters to safety. All of that said, I did find myself rather relishing in the solid tension the film provides in large chunks. Wilson may be a bit of odd casting, but it works because Jack isn't supposed to be a believable hero. This is one of those situations where the challenges set in front of a person bring out a side of them they didn't even know they possessed and Jack is a fighter when it comes to his family, he does what he has to in order to keep them safe and alive. Wilson and Bell have little to no chemistry, but Bell holds her own and as a family unit the four actually gel really well with Wilson being the charmingly goofy dad and Bell being the strong, supportive female figure that influences their two girls well. With these characters the Dowdle's intend for us to really feel their plight. The aforementioned discussion that would like to add moral ambiguity to the situation would actually place the Dwyer's as more of the villains than those after their heads, but alas they are who we are rooting for here and largely because of the committed performances and familiar family dynamics we stick with it. The director also really wants us to feel every life that's taken, but his camera cuts away too quickly from the unrelenting brutality to really allow it to leave an impression. Where this goal does succeed is the moment when Jack realizes he must kill someone for he and the rest of his family to survive. It doesn't gloss over this aspect of the journey and I rather appreciated the insight even if it is only a flash in the pan. On the negative side of things Dowdle also likes to utilize the slo-mo effect just a little too much as there are a handful of scenes that incorporate this technique and inadvertently turn moments of super-seriousness into those that unintentionally elicit laughter. As a piece of late summer entertainment though, No Escape is completely competent, insanely tense and can be rather thrilling when it chooses to be. If only the brothers Dowdle had taken the time to really add some depth to their narrative we might have had something that really overcame the odds.